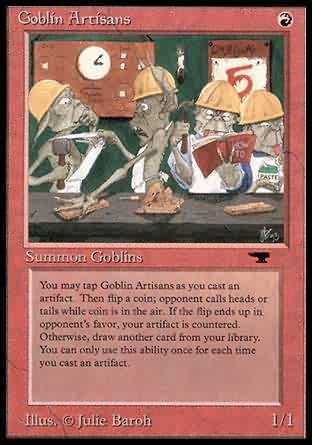 You may tap Goblin Artisans as you cast an artifact. Then flip a coin; opponent calls heads or tails while coin is in the air. If the flip ends up in opponent's favor, your artifact is countered. Otherwise, draw another card from your library. You can only use this ability once for each time you cast an artifact. T Flip a coin. If you win the flip, draw a card. Otherwise, counter target artifact spell you control that isn't the target of an ability from another creature named Goblin Artisans.